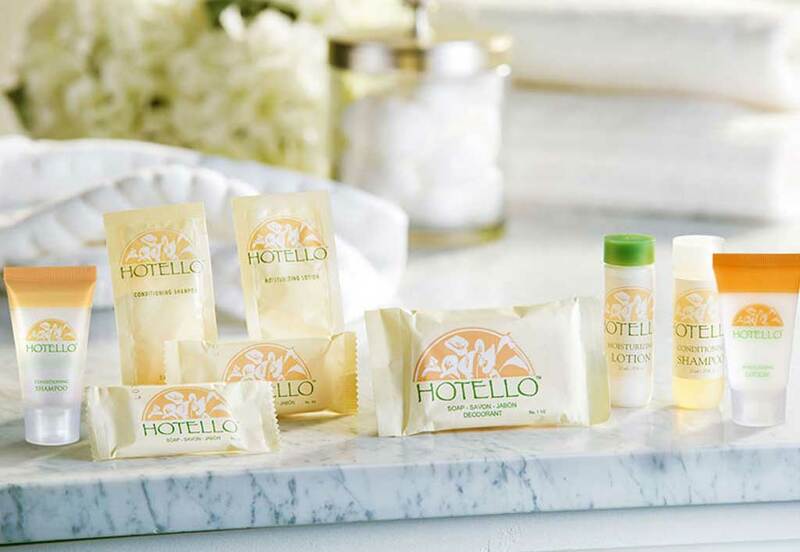 Hotello soap and amenities collection is a fine face & body soap with a funny name that is easy to remember. Created with the value buyer in mind, this line with the classic looking packaging in light pastel colors is an excellent product choice for both amenity and institutional markets. Hotello combines with almost any bathroom decor. For a rich cleansing experience use Hotello Bar Soap in the bath or shower. This nourishing body cleanser thoroughly cleanses skin of dirt and impurities. Leaving skin hydrated, supple and silky to the touch. With a light and fresh scent, this collection will be a hit with your customers. Hotello shampoo and conditioner will leave hair soft, smooth, stylish and irresistible. Your customers will thank you for clean, nourished and healthy looking hair. Made with natural ingredients, this gentle formula leaves hair shiny and manageable. Your customers will be ordering this one for years to come. This ultra-effective hand and body lotion helps to instantly hydrate, smooth and calm dehydrated skin. This fabulously scented hand and body lotion, goes on light yet leaves skin feeling soft, smooth and moisturized.